While this recipe is delicious on its own, feel free to add some bacon, smoked pork hocks or and Andouille type sausage. Cook the greens in a large pot of boiling salted water until tender, about 8-10 minutes. Scoop out greens, reserving water. Coarsely chop greens and set aside. Meanwhile, make the roux. In a large heavy stock pot heat the oil/butter over medium heat. Whisk in the flour, reduce the heat to low, and stir constantly with a flat wooden spoon, until the roux is a dark reddish brown color, about 15 minutes. (A very dark roux is what gives gumbo its distinctive rich taste, so take the time on this step.) Stir in the seasonings and then add the veggies. Cook for 10 minutes, then stir in the garlic, 2 teaspoons salt, and 7 cups of reserved cooking liquid. 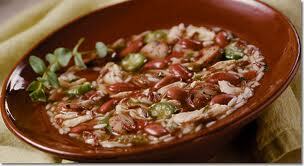 While occasionally stirring, bring mix to a boil, lower heat and simmer for 20 minutes. Add the beans and greens, cooking for 15 minutes more. At this point, start tasting the beans, adding salt, pepper, hot sauce, and apple cider vinegar to balance the flavors and heat for your tastebuds. Serve with cooked rice or cornbread.